There's a secret program to brainwash unwitting Americans into carrying out nefarious tasks. Talking dolphins are being trained as underwater assassins. And the Masons have hidden a vast treasure in catacombs underneath Mount Rushmore. 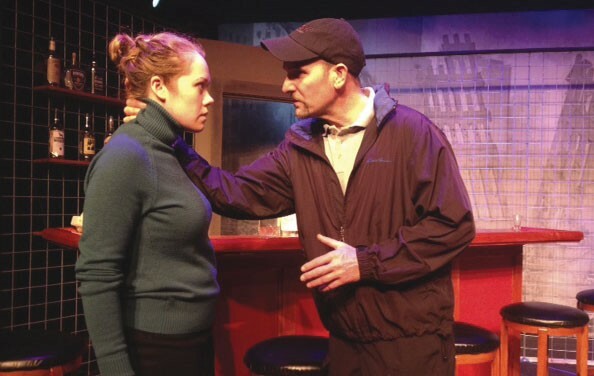 Those are about the only recent conspiracy theories not touched on in Steven Dietz's 2007 comedy-drama Yankee Tavern, directed by Elizabeth Craven and running through Feb. 23 at Main Stage West. Set just a few years after 9-11, Yankee Tavern takes place in the titular New York watering hole, housed in a soon-to-be-demolished building not far from Ground Zero. The nifty set by Paul Gilger sets the tone, suggesting that the Yankee was once a grand establishment and is now slipping toward decay. Adam (Tyler Costin, a bit one-note and lacking the sense of practiced duplicity suggested in the script) is a grad-school student hanging on to the tavern once owned by his father, who may or may not have killed himself behind the bar. His increasingly tentative fiancée, Janet (Ilana Niernberger is fine, but a bit too hostile out of the gate) has just discovered that most of Adam's save-the-date notices have been returned as "address unknown," and she wants to know why. Meanwhile, they both want to know what to do about the tavern's resident alcoholic Ray (played with gleefully grounded mania by the ever-brilliant John Craven), who has never met a conspiracy theory he didn't like. Starbucks is a religious cult. The moon landing was faked. The Olympics are secretly staged by Walt Disney. Yoko Ono was the mastermind of the Bay of Pigs disaster. The 2000 election was rigged—so that Al Gore would have free time to make documentaries about global warming. And the destruction of the Twin Towers was an inside job. Of course. Next to JFK's assassination, few national tragedies have inspired more conspiracies than this one, and in Dietz's hands, the intricate, mesmerizing language of conspiracy becomes a kind of paranoid poetry. When a stranger (Anthony Abaté, nicely creepy) arrives at the tavern, ordering two beers and leaving one untouched, Ray's enthusiasm for secrets is matched by the stranger's quiet, menacing suggestions that the real truth behind 9-11 is bigger and scarier than even Ray could imagine. To say more, or to hint at how all of this is connected to Adam and Janet, would be unfair to the audience. Suffice it to say that in Yankee Tavern, the truth is out there. Way, way out there.